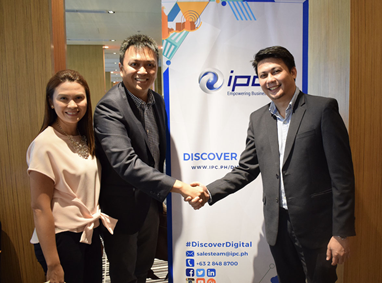 (L-R) Sheila Oseña, VP for Finance and John Henry Oseña, President of Web.com.ph with Niño Valmonte, Director for Marketing and Digital Innovation of IPC at a previously held #DiscoverDigital seminar. Web.com.ph, one of the country’s leading e-commerce service providers specializing in domain name registration and hosting, recently tapped IPC (IP Converge Data Services, Inc., a subsidiary of ePLDT, Inc.) to colocate their servers in the latter’s data center facilities. Originally colocated in the United States, the company fully migrated its servers to the Philippines to address connection, stability, latency, and data sovereignty issues. Through this partnership, IPC will be hosting Web.com.ph’s servers in their data centers, and will handle the necessary measures to preserve business continuity such as power, cooling, bandwidth, physical infrastructure, data security, among others. IPC’s flagship data center located in Paranaque City is accredited by Japan’s NTT Communications as one of its over 140 Nexcenter facilities around the world. The company is also certified for ISO 9001 and 27001, which pertain to Quality Management Systems and Information Security Management Systems respectively. De Leon adds that by colocating in IPC’s data centers, Web.com.ph’s customers stand to experience utmost Internet service quality and speeds as a result of IPC's data communications network that’s peered with all major domestic and international carriers in the region. IPC operates its own Asia Pacific network with bandwidth capacity on multiple undersea cable facilities. Founded in 2004, Web.com.ph, currently serves as the Internet domain provider of over 6,000 clients. This number simply reflects the capabilities of its technical support staff which consists of Red Hat Certified Technicians (RHCT) and Novell Certified Linux Professionals NCLP, who are supported by a number of highly competent webmasters, graphic designers, and web developers. “With our servers being colocated abroad, it was an ongoing challenge serving Philippine clients due to connection issues. We addressed this with our partnership with IPC. They have the cost advantage along with the stability of the platform. What made us partner with them, to summarize, are: Cost and Top-notch infrastructure,” said John Henry Oseña, President and Systems Administrator of Web.com.ph. A local cloud services pioneer in the country, IPC owns and operates three state-of-the-art data centers, located in Makati, Parañaque, and at Bonifacio Global City, Taguig. These robust, globally compliant facilities offer full infrastructure and telecommunications redundancy that protect every client’s mission-critical data and applications, and assure uninterrupted operations against connection issues, cyberattacks, and downtime. IPC’s data centers are a part of ePLDT’s nationwide chain of VITRO Data Centers. IPC® (IP Converge Data Services, Inc.) is an Internet data center, telecommunications and cloud services company, providing local and regional enterprises with managed data services and business solutions at international standards. Certified with ISO 9001:2015 Quality Management Systems and ISO 27001:2013 Information Security Management Systems, the foundation of IPC's business is customer satisfaction, ensured through high-quality on-time service delivery, best practices, and a personalized, "boutique" approach to clients. IPC is an ePLDT company.